[EXPIRED] CHRISTMAS OFFER – UK POSTAGE ONLY £1! Sorry this offer has now ended. Don’t leave it to late too do your Christmas shopping. Our last posting date is THIS THURSDAY, 18th DECEMBER 2014. Offer ends 9am on Wednesday 17th December 2014. This offer applies to UK postage only. This entry was posted in Site News and tagged antiques, Christmas Shopping, collectables on December 15, 2014 by Perfect Pieces. This entry was posted in Site News and tagged Christmas Shopping, Merry Christmas on December 25, 2012 by Perfect Pieces. This entry was posted in Site News and tagged Christmas Shopping, Happy Christmas on December 25, 2011 by Perfect Pieces. We will despatch ALL items to you within ONE WORKING DAY on the run up to Christmas! ALL items require a signature on delivery so please ensure you’re in or have time to collect it from the Sorting Office if you’re not. Usually, if we receive your order and cleared payment before 3pm on any working day we will despatch you item to you that day. If for some reason we’re unable to meet this we GUARANTEE to despatch your purchase to you within ONE WORKING DAY of receiving your cleared payment on the run up to Christmas 2011! Note – If you’re paying by UK cheque then we have to wait 5 working days for UK cheques to clear before posting items out. *Please remember – whilst we will pack and despatch you purchase to you efficiently and on-time we cannot be held responsible if Royal Mail deliver later for some reason or if you’re not in to sign for the parcel and it is taken to the local sorting office. This entry was posted in Site News and tagged Christmas postal dates, Christmas Shopping, Gift Ideas on December 1, 2011 by Perfect Pieces. Browse the Perfect Pieces website either using the menus on the left to select the Pottery you are interested in or simply click the View All Stock link in the top menu bar and browse our entire range! If you’d like to buy the item simply click on the bright green button, Buy Now, and it’ll be added it to your shopping basket. Now the hard work is done, you’ve chosen your gift! You shopping basket will now be displayed to make you purchase simply click Proceed To Checkout where you’ll be shown a summary of your order including any postal charges. All you need to do now is select your payment method. If you’d like to pay using your Credit/Debit card we take you payment using PayPal – PayPal is very secure and doesn’t require registration to make a payment. Simply click on the button and this will take you to PayPal where you’ll be able to view your order summary again and make your secure payment with your card in a few very simple and safe steps. Alternatively, if you’d like to pay by UK cheque or are an overseas buyer simply enter your details in the form at the bottom of the page and click Submit Order. You’ll then receive a confirmation email from us – DO CHECK YOUR SPAM FOLDER IF YOU DON’T SEE ANYTHING FROM US IN YOUR INBOX. We’ll be in touch with you by email with details on how to make you cheque payment – we usually get back to you within a few hours. This entry was posted in Site News and tagged Christmas Shopping, Gift Ideas on November 23, 2011 by Perfect Pieces. Perfect Pieces Christmas Shopping Guide Newsletter – Out Now! The latest Perfect Pieces Newsletter has now been published. This month we take a look at how to make your Christmas Shopping easier! There are several different ways of browsing the items we have for sale on the Perfect Pieces website and this newsletter shows you them all. So, if you’ve started your shopping and are in need of some help or just generally feel like buying yourself a treat then why not have a read? If you’d like to receive our Newsletter straight into your email inbox then simply fill in you email at the bottom of the Newsletter and you’ll receive our next on – it’s that simple! This entry was posted in Newsletter and tagged Christmas Shopping, Gifts, Perfect Pieces on November 12, 2011 by Perfect Pieces. This decorative plate measure 27cm in diameter and is decorated with a very striking blue background and bold pink and purple flowers. It has been finished with fine detailing to the flower-heads and finally a gilt rim. It’s a lovely present for anyone if you’re starting to think about Christmas presents! Remember, when Christmas shopping to get your orders in early – we can’t guarantee what stock we’ll have as the big day approaches. Buying Antiques is unpredictable not like deliveries to high street stores! 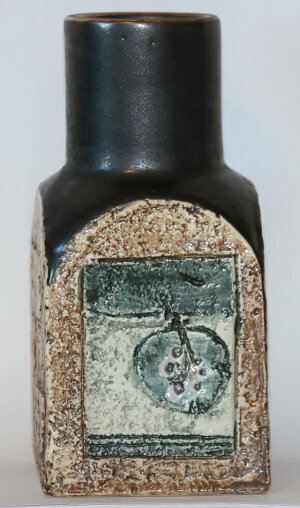 This entry was posted in New Stock and tagged Art Deco, Christmas Shopping, Gift Ideas, Gray's Pottery, Pottery plate on November 2, 2011 by Perfect Pieces.